The hole 53-year-old Keys found himself in after Saturday’s ‘private’ conversation with Sky’s resident football expert was deepened further by his ill-advised interview on Wednesday. He went around in circles, spoke of the “banter” he shared with Sian Massey whilst apologising, the cheek of Karen Brady not to answer his calls or reply to his texts and his fondness for the 55 year-old Gray. There were digs at Rio Ferdinand and questions raised over the topics of conversation in the Manchester United dressing room. All murmurings of a smug little man who doesn’t seem to see what he has done wrong. 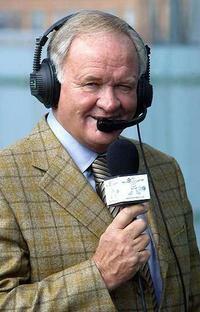 Invariably, comparison has been drawn to the Ron Atkinson affair from 2004. ‘Big Ron’ was also caught out by a blasted microphone, reeling off a explanative laden racist attack on the performance of Chelsea defender Marcel Desillay following a 3-1 Champions League semi-final defeat to Monaco. He was sacked from his co-commentator’s job and lost his newspaper column with the Guardian. Out went the image of a perma-tanned, sheepskin coated, sovereign wearing granddaddy of English football, replaced by a bitter, sour and unforgivable bigot. Big Ron's big mouth cost him his job. But can anyone remember who Atkinson was working for that infamous night? After a moment’s thought, one recalls it was ITV. Was the channel’s reputation questioned at the time? Were we all asking if the offices within the station are rife with racism and bigotry? No, if I remember correctly. Atkinson was blamed and punished. He was the individual who took all the heat and his employers that evening were kept out of the spotlight. 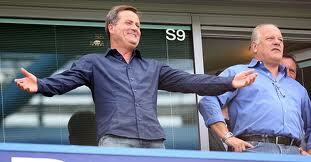 The working conditions within the walls of BskyB are suddenly in the firing line. Former employees are complained of the boorish and macho atmosphere created within Sky Sports, more akin to a working man’s club than a national broadcaster. The individuals involved are obviously having the finger of blame pointed at them, but a sub-plot of why such behaviour and attitudes were tolerated within the company itself is gathering interest. It is not the kind of publicity that Sky and its owners want for what is seen as the jewel in their crown. Football is a male-dominated arena. Dressing rooms are full of young, fit men, living their dream and getting paid a fortune to do so. Many are cut off from reality, living in their own bubble of yes-men, yes-women, cars and always getting their way. Agents cater for their every need and they strut around with an aura of invincibility. Unfortunately, this feeling of superiority somehow managed to seep its way into the minds of two men paid to merely observe and comment on these men’s efforts on a football field. Keys and Gray were not expected to mimic their subjects’ actions. Sky’s reputation was on the line and they had to be seen to act firmly. Gray’s star seemed to be on the wane, but the same could be said of many of the football output on the station. Apart from the matches themselves, Soccer Saturday seems to be the only aspect of the approach still producing quality and impromptu debate on the game. People have tired of Gray patronising his wide-eyed accomplice on the idiosyncrasies of the Wigan offside trap. There is only so much one can take. The ignorance and arrogance of both men have perhaps made a decision for the powers that be that they would have been reluctant to make themselves. So now begins a new era for live football. Or so we will be told. Keys and Gray’s insular humour isn’t the reason people fork out their hard-earned money on a monthly basis to subscribe to Sky Sports. It’s the ‘product’. The football. The game has survived almost 150 years. Two men as part of the circus around it will be no loss. Especially after showing us what they are really like.